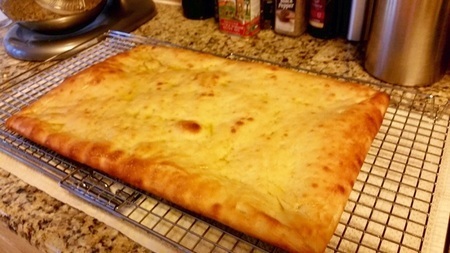 Did a Sicilian style tonight for my wife to take to a pot luck. 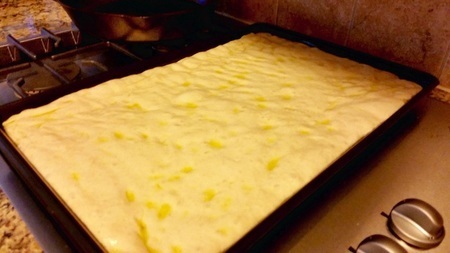 I made the dough without starter due to time constraints; I think a starter would have made it just a little better. Also didn't have time to go to the deli and get sliced mozzarella so I used shredded which made it a little harder to get the sauce on top of it as neatly as I would like. The sauce is one part Bonta, two parts 7/11's, hand crushed tomato fillets, dried oregano, salt, olive oil and a couple fresh basil leaves from the backyard. Not being able to have a couple squares was frustrating; should have made two. Pretty sure this will be the most popular item at the pot luck. Man, I could go for a slice of that right now. Nice job Chuck! Looks amazing! Nice work, Chuck. 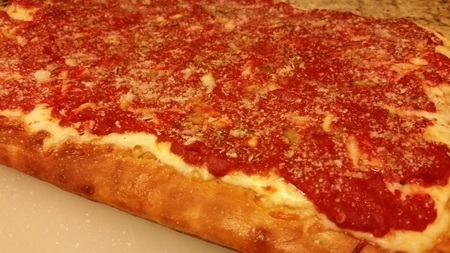 Sicilian pizza has become our latest favorite. We like the crunchy bottom which serves as a foil to the more cake-like crumb, the variability of topping ratio (we like more tomato sauce with the thicker crust), and the fact that it can be par-baked, so it works well for groups. I originally made one a few months ago to act as a strong base for a friend of mine who loves to go overboard with meat toppings, which is way too heavy a load for thin crust pizzas (he uses Boboli and other store-bought crusts for his "meatzas"). We put the tomato sauce on as a base and use shredded mozarella on top of that, so I am not clear as to what the problem was that you had with having to use shredded mozzarella as opposed to slices unless I am violating an old Sicilian law that the mozzarella needs to be the initial layer ( in which case I may be sleeping with the fishes....). With attention, I have not found that the exposed cheese burns. 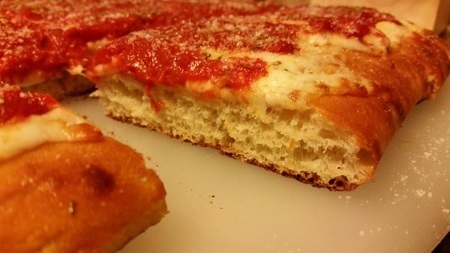 We have found that with the thick crust, we enjoy much more tomato sauce compared to a thinner crust. Your crust is lovely--stretch as I will, mine only rarely will fill out to the very corners. I learned to make it flatter by popping any obvious bubbles with a scissors before baking. The question: why the preference for mozzarella under the sauce? The cheese first then sauce just give a different texture and, to me anyhow, a different flavor. That's how they do it at L&B Spumoni Gardens and several of my favorite pizza places I have tried. I like it the other way around too and I would definitely do cheese on top if I were adding any toppings. The sauce on top is the reason shredded cheese was a problem. It is much easier to spread on top of slices.To get the dough into the corners I have found that really letting it relax then lifting a corner and over stretching it a time or two allows it to shrink back and fit nicely. Stretch it until it hangs outside of the pan a little and let it slide back in, tucking into the corner. Thanks for the reply. Yes, I stretch opposite corners until oil is dripping all around the pan (LOL), wait about 1/2 an hour and stretch again. I think I am just too impatient. It certainly doesn't affect the taste---the only thing that has affected the taste is if I don't paint the sauce out to the edges as they will get a bit crispy prior to the rest of the pizza being finished. WRT sauce, I have been using 6-in -1 from Escalon, as it is available retail. You use Bonta, which is one of their commercial products. Big difference in flavor? Bonta is a heavy purée, 1.09 specific gravity I think. Basically it is like a tomato paste. I have bought a similar product from a local Italian Deli in a smaller can but I forget the brand. It has more of a deeper, less sweet flavor than Super Dolce but not quite as intense as some tomato pastes. That's just my perception of course. To me it works well on thicker, heavier pizzas. The 7/11's hat I used would basically be the Stanislaus brand equivalent of the 6-in1's. They have maybe a little lighter flavor but probably not enough to difference for me to justify buying a case of the big cans again. I will probably switch back to 6-in-1 when the 7/11's are gone. I got the Bonta at pennmac.com. The shipping is high on just a can of tomatoes but it become more reasonable on a per item basis if you order more stuff with it. I am also in the material handling industry so I have a lot of contact with food processors and food service distributors. Every now and then I can score a can of this or that. I don't see why an independent restaurant owner wouldn't agree to sell a can or a case of tomatoes. They could mark it up and make a little extra cash.